Right when they first came out, I bought one of the original 7″ Kindle Fire Tablets. I use it for games, movies, listening to music and looking up facts on IMDB. While I don’t normally like reading on it (I prefer e-ink), I do find that the full color is great for reading cookbooks. At Christmas, I received one of the 8.9 Kindle HD Fires as a gift and now use that one for most of my movies, music and games. But I have reached the point where I own enough Kindle cookbooks that I am actually considering dedicating my original Kindle Fire for use solely as a cookbook. I actually have so many cookbooks purchased across two Amazon accounts, I am also considering buying another 7″ Kindle Fire to use as a second cookbook for the other account. Since my intended use for the device is so specific, I don’t necessarily need the latest model, at least not for a cookbook. So, I am trying to decide whether to buy a new one, a certified refurb or a used one. And, as I am starting to research these options, I realized that trying to compare apples to apples is a little more complicated than I originally thought it would be. The first difficultly is that people frequently use names for the Kindles that are not the official Amazon device names. For a long time, Amazon just called the latest edition of the device just the Kindle (no numbers), as if the earlier versions didn’t exist. Just look at the e-ink line: What many people call the Kindle 3, for example, is now officially called the Kindle Keyboard. And the $69 Kindle is alternately called by most people either the Kindle Basic or the Kindle 4 or Kindle 5 (there are two versions, based on a difference in color). The model names on the Kindle Fires are especially confusing. Let’s look at just the one I am looking for: the 7″ tablet. There’s the original Kindle fire, the new Kindle Fire (which was called the Kindle Fire 2) in either 8GB or 16GB, the Kindle Fire Hd (16GB), the Kindle Fire Hd (32GB), and the 2013 Kindle Fire HD 16GB. 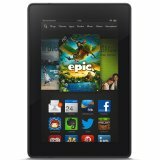 There are also four separate versions of the Kindle Fire 8.9! The newer versions of the Kindle HD tablets are now called the HDX. And some devices are WI-FI only and others have cellular. It became really apparent to me that some people might not know exactly what model Kindle they have. Obviously, I want to know what model I am buying. But even if you are not in the market for a used Kindle, it can be very helpful to know what model Kindle you own. It makes a big difference with support questions; each of the different models works in different ways and has specific features. And if you want to buy a case or accessories, you HAVE to know what model you have; the cases are not interchangeable. So, how do you find the model for your Kindle? Amazon does have a help page for identifying your Kindle model and that’s a good place to start. If you are still not sure which one you have, you may need the model number. To find it, from your computer, log in to your Amazon account and under account, choose Manage Your Kindle. On the left sidebar, go down to Your Kindle Account and click on Manage Your Devices. You will then see all your Kindles and apps listed. The first four characters are your model number. If you have the original box, the Amazon model number is printed on the box. You can also access the model number from the settings page of the device. Once you have the model number, you can find out which Kindle or Fire version you have. MobileRead has a chart where you can look up the number and it will tell you which model you have. This chart does not seem to indicate the HDX models. If the model number doesn’t help, you may be able to determine which model you have by looking at the feature list. This is particularly helpful on the Kindle Fire HD models, where the 2012 version has a micro HDMI port and the 2013 version doesn’t . And, if you have the Mayday feature on your Kindle Fire, you have the HDX!